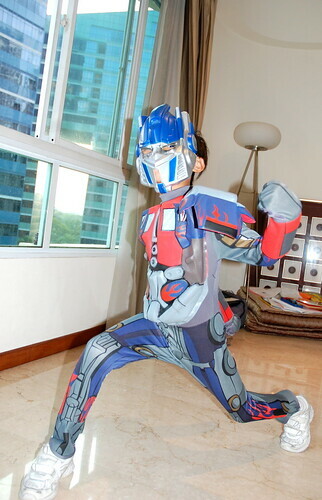 Be Optimus Day.. - A mummy's inane blabberings.. Anyway...the theme of BYD in ACSJ was 'Heroes'. I was having a hard time trying to explain to Aidan the attributes of a hero. He keeps associating heroes with 'superheroes' & superpowers. So, I tried using examples like firemen who risked their lives saving people & their homes or policemen who help to keep law & order by catching thieves. But the boy rebutted that they were merely doing their job so why should they be considered heroes then. Alamak..how to answer ah?? I should tell him that all mothers should be considered heroes especially if their kids are as smart-alec as the one I have..
To all teachers out there, have a "Happy Teacher's Day!". Definitely not an easy job which requires tons of patience and understanding (especially if you got a kid like Aidan in your class..). I salute u guys! SO CUTE! I love the second-last shot of him!!! 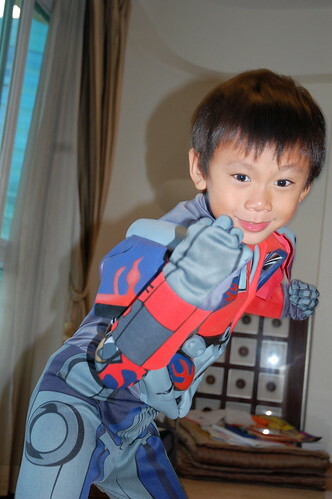 My boys school BYD is on 30 Sep. P5 theme is Cosplay so Tim is going to be Naruto. P2 theme is Animation movie and Royce has a hard time deciding who he wants to be...for now it is Master Wu Gui in Kungfu Panda! I've got to make a turtle shell for him! WOW!!! Very very cool!!! Complete with the superhero pose! wah now school got such things?????? err yeah. quite a no. of schools (both primary & sec) take part in be yourself day'. 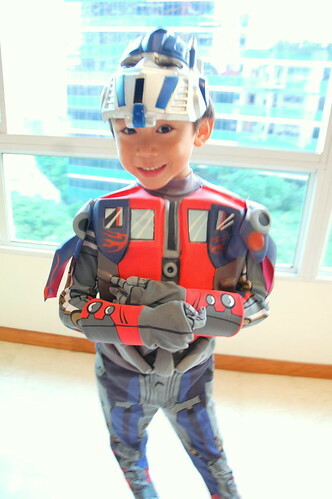 yeah school was never that happening during my time either..
aiyo aidan is sooooooooo cute! and cool teachers' day celebration! too bad i couldnt take pics of the celeb in school. oh..it is up to the schools whether they wanna participate in byd..quite a large no. of schools take part actually, close to about 60! yeah..he still is quite baby-ish at times but not as 'cute' actually..you're right. 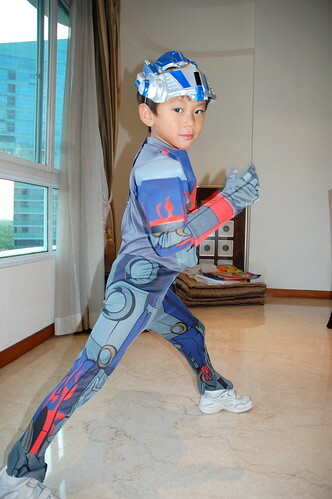 he's slimmer and slightly taller now..
haha, Aidan really can be a model when he grows up ! heh, this boy bway paiseh sort lah. love to pose. but it is easier at this age..
heh, didn't take that much pics in bkk. yeah..he was super noisy on the plane yah! think at that time, he wanted to play his psp but the plane just took off. so cute! wat did the other boys dress as? heh, but the things that come out of their mouth can be really amazing n funny at times..